The technological dream of an ‘artificial general intelligence’ is seen by some as a future game-changer for economic development. But it could also pose an existential threat to humanity – a challenge known as the ‘control’ problem. This column argues that it is therefore essential to carefully consider all of the public policy implications. The world has made spectacular progress in economic development and there is optimism that the march of progress will continue. Steven Pinker reflects on a large number of measures to illustrate this progress. Steven Radelet echoes this, reminding us that ‘global poverty is falling faster today than at any time in human history’. Nick Bostrom also calculates that if the economic growth rates of the past 50 years can be sustained, the world will be 34 times wealthier by 2100 than now. There is consensus that without technological innovation, this progress in economic development would not have been possible. Countries and regions that have failed to use technology sufficiently have tended to fall behind. Diego Comin and co-authors find that ‘78% of the difference in income today between Africa and Western Europe can be explained by differences in technology that already existed in 1500 AD’. Joel Mokyr and Matt Ridley believe that technological progress will continue. Ridley expects that ‘the pace of innovation will redouble, and economic evolution will raise the living standards of the twenty-first century to unimagined heights, helping even the poorest people of the world to afford to meet their desires as well as their needs’. In recent years, especially since 2007, we have seen a resurgence in ‘tech-optimism’ due to the emergence of new technologies such as digital platforms, the Internet of Things, nanotechnology, genetic engineering, smart materials and, perhaps most importantly, artificial intelligence (AI). As a New Scientist book explains, AI refers to ‘machines that act intelligently…when a machine can make the right decision, in uncertain circumstances it can be said to be intelligent’. There has been rapid progress in AI as a result of exponential increases in computing power, big data availability, cloud computing and the development of machine learning algorithms. Digital platform companies, including Apple, Amazon, Facebook and Google – all of which rely on, innovate and invest heavily in AI – have become the most valued companies in the world. PwC forecasts that these AI applications will add 14% to global GDP by 2030 – a total of $15.7 trillion. But these applications are not yet very smart, and are nothing approaching human intelligence. Hence all AI currently in existence is often referred to as ‘narrow’ AI as opposed to the still far-off dream of an ‘artificial general intelligence’ (AGI), which will be a real super-intelligence. While narrow AI can bring many benefits to economic development (as discussed at a recent World Bank Conference on ‘Artificial Intelligence for Development’), it is the potential invention of an AGI that is seen by some as a future game-changer for economic development. The point at which AGI will exceed human intelligence is termed the ‘singularity’ by Raymond Kurzweil. Some economists, such as William Nordhaus, believe that after this, ‘economic growth will accelerate sharply as an ever-increasing pace of improvements cascade through the economy’. But there is one major caveat. Whichever high-tech firm or government lab succeeds in inventing the first AGI will obtain a world-dominating technology. This potential ‘winner-takes-all’ prize raises the specter of a competitive (arms) race for an AGI. The problem is that such a race may result in a poor-quality or unfriendly AGI, which is not aligned with human welfare – a problem known in the AI field as the ‘control’ or ‘alignment’ problem. Such an unaligned AGI could destroy humanity, it may be misused by terrorists or dictators or it may benefit only the elites. Optimism about the march of economic development may be disappointed by the very ability – technological innovation – that gave rise to it in the first place. In order to cast more light on the control problem, we have developed a model of an AGI arms race based on an ‘all-pay contest’. Through our analysis, we establish the following results: First, in a winner-takes-all race, where players must invest in research and development (R&D), only the most competitive teams will participate. Thus, given the difficulty of AGI, the number of competing teams is unlikely to ever be very large – a positive conclusion given that the control problem becomes more vexing the more teams compete. Second, the intention of teams competing in an AGI race, as well as the possibility of an intermediate prize is important. The latter will provide incentives for investment in R&D and hence the quality of the AGI, but it will also improve the probability that an AGI will be invented – and hence make public control even more urgent. Ensure access to and dissemination of knowledge and tools in AI, including its public understanding. 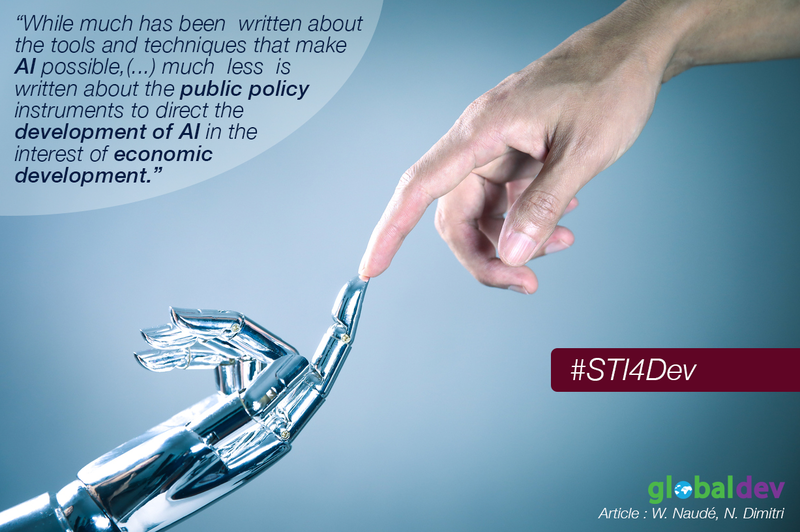 While much has been written about the tools and techniques that make AI possible, and more is written on the potential impact on development, much less is written about the public policy instruments to direct the development of AI in the interest of economic development. Our work begins to fill this gap. Wim Naudé is Professor at Maastricht University and Maastricht School of Management, and Professorial Fellow at UNU-MERIT in the Netherlands. 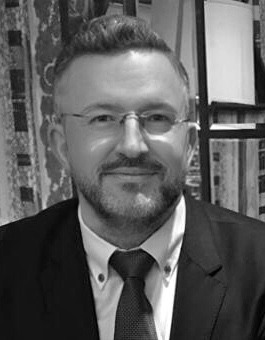 Nicola Dimitri is Professor of Economics at the University of Siena (Italy), Visiting Professor at the Institute for AdvancedStudies (IMT) Lucca (Italy) and Life Member of Clare Hall College (Cambridge, UK).